LOS ANGELES, Calif. /California Newswire/ — On Wednesday, seven and a half years after taking office and inheriting a $27 billion budget deficit, California Governor Edmund G. Brown Jr. signed his final state budget, which fills the Rainy Day Fund to the brim and sends record funding to California’s classrooms. 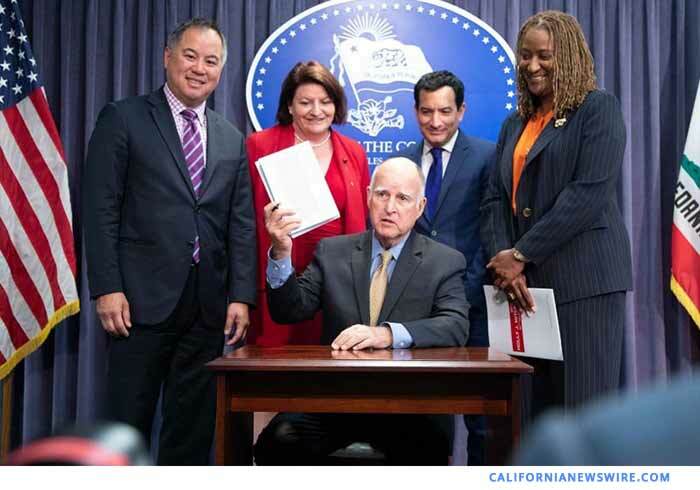 The Governor was joined today by Senate President pro Tempore Toni Atkins, Assembly Speaker Anthony Rendon and budget chairs Senator Holly J. Mitchell and Assemblymember Phil Ting. The state’s Rainy Day Fund, established by a vote of the people in 2014, saves money when the economy is strong for uncertain times ahead. By the end of 2018-19, the current economic expansion will have matched the longest in post-war history. The budget fully fills the fund, growing the balance to an unprecedented $13.8 billion. The budget increases funding by more than $4,600 per student over 2011-12 levels and directs $78.4 billion in funding to K-14 schools – a 66 percent increase in annual funding from seven years ago. Additionally, the state will fully implement the Local Control Funding Formula, correcting historical inequities in school district funding. The budget invests $5 billion to help address challenges with affordable housing and homelessness, including providing $500 million to assist local governments in their immediate efforts to help homeless Californians. The state also continues to provide billions of dollars to: raise the state’s minimum wage; grow the state’s Earned Income Tax Credit program; expand health care coverage to millions more Californians; restore low-income health benefits eliminated during the recession; boost CalWORKs grants; and increase child care and early education provider rates and the number of children served. This budget delivers the first full year of funding under Senate Bill 1 – the state’s Road Repair and Accountability Act – with $4.6 billion in new transportation funding in 2018-19. The funding will repair neighborhood roads, state highways and bridges, fill potholes, ease congestion in busy trade and commute corridors and improve and modernize passenger rail and public transit. The budget continues to increase funding for the state’s university and community colleges systems with no tuition or fees hikes and establishes the state’s first-ever online community college. Since 2012, the University of California has received $1.2 billion in new funding, with $1.7 billion for the California State University and $2.4 billion for community colleges over the same period. The budget includes a $1.4 billion Cap and Trade Expenditure Plan to invest in programs that further reduce carbon pollution and support climate resiliency efforts, including $210 million for forest improvement and fire prevention projects that protect the state’s forests from wildfires and $334.5 million for the California Energy Commission and the California Air Resources Board to begin the implementation of a multi-year initiative to accelerate sales of zero-emission vehicles through vehicle rebates and infrastructure investments. The budget provides $79 million to support hardworking immigrants through a number of legal services programs, including deportation defense, naturalization services and DACA assistance. AB 1808 by the Committee on Budget – Education finance: education omnibus trailer bill. AB 1809 by the Committee on Budget – Higher education trailer bill. AB 1810 by the Committee on Budget – Health. AB 1811 by the Committee on Budget – Human services omnibus. AB 1812 by the Committee on Budget – Public safety omnibus. AB 1817 by the Committee on Budget – State government. AB 1824 by the Committee on Budget – State government. AB 1825 by the Committee on Budget – Education finance: constitutional minimum funding obligation: local control funding formula. AB 1826 by the Committee on Budget – State Capitol Building Annex: state office building. AB 1827 by the Committee on Budget – No Place Like Home Act of 2018. AB 1830 by the Committee on Budget – Budget Deficit Savings Account: Safety Net Reserve Fund. AB 1831 by the Committee on Budget – State government: appointments: infrastructure. AB 1834 by the Committee on Budget – Corrections: omnibus. SB 840 by Senator Holly J. Mitchell (D-Los Angeles) – Budget Act of 2018. SB 841 by the Committee on Budget and Fiscal Review – Budget Act of 2017: augmentation. SB 847 by the Committee on Budget and Fiscal Review – Courts: omnibus. SB 848 by the Committee on Budget and Fiscal Review – Transportation. SB 849 by the Committee on Budget and Fiscal Review – Medi-Cal. SB 850 by the Committee on Budget and Fiscal Review – Housing. SB 852 by the Committee on Budget and Fiscal Review – State public employment: memorandum of understanding: State Bargaining Unit 6: approval. SB 853 by the Committee on Budget and Fiscal Review – Developmental services. SB 854 by the Committee on Budget and Fiscal Review – Public resources. SB 855 by the Committee on Budget and Fiscal Review – Taxation. SB 856 by the Committee on Budget and Fiscal Review – Budget Act of 2018. SB 866 by the Committee on Budget and Fiscal Review – Employment. SB 871 by the Committee on Budget and Fiscal Review – Income taxes: credits: motion pictures. For full text of the Budget Act and associated legislation, visit: www.leginfo.legislature.ca.gov. Additional details on the 2018-19 State Budget can be found at www.ebudget.ca.gov.